Carly Smallman sings funny songs. She was born in 1985, but didn’t begin performing stand-up comedy until 2009. Her unique blend of outrageous impropriety and adorable sincerity has established her as a firm favourite in London clubs and beyond. She has played at some fabulous venues, including Banana Cabaret, The Covent Garden Comedy Club, Spank, Amused Moose Soho, and Comedy Camp. 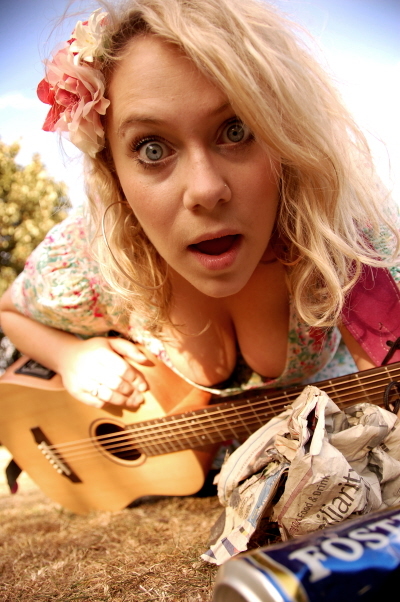 In 2010 she was first runner up in the Bedford New Comedian of the Year competition, and a Laughing Horse semi-finalist. In 2009 she was an Amused Moose Hot Starlet, and was also shortlisted for the final of the Musical Comedy Awards. Recently, Carly appeared on THE ROB BRYDON SHOW (BBC2), and is soon to be seen criticising people who are more famous than herself on THE TOP FIFTY PLASTIC SURGERY SCHOCKERS (E4). Carly is also one half of double act YOU’RE NOT THE ONE, with Luisa Omielan. Their 2010 Edinburgh show, ‘A Guide to Love and Dating’ was a complete sell out…if you can call a free show a sell-out. Basically, no more people could fit into the venue.